In November, the Supreme Court of Ukraine is to adjudicate on the dispute between Ukraine’s two largest pharmaceutical manufacturers in respect of the “Corvalol” brand, popular since the Soviet era. The Ukrainian News discussed the merits and prospects of this dispute with Dmytro Taranchuk, Head of the Legal Department of Farmak JSC, which has been manufacturing “Corvalol” since mid-20th century. He also told about whether the company had had similar litigations, as well as about Farmak’s reaction to its inclusion in the Russian sanction list. What is the current stage of the dispute with Darnitsa over the “Corvalol” brand? First, I would like to tell a bit about the drug product and the brand. The name “Corvalol Corvalolum” is well-known to consumers and this designation is placed on drug packaging since 1991. Preparation for the production of “Corvalol Corvalolum” was initiated by Lomonosov Kyiv Chemical and Pharmaceutical Plant, which legal successor is Farmak JSC. The drug name was invented by employees of the Central laboratory of Lomonosov Plant. The first batch of the drug product “Corvalol” was released in 1960. Since then, Lomonosov Plant was the only manufacturer of “Corvalol” in the former USSR. Since 1991, Farmak JSC has been the only manufacturer of this drug product under “Corvalol” brand in the post-Soviet area. Furthermore, “Corvalol” trademark is protected in 14 countries of Europe and Central Asia. The use of the brand “Corvalol Corvalolum” is entirely confirmed by packaging for the period from 1991 to 2002 inclusive; information about it was regularly published in specialized publications, encyclopedias and reference books. Speaking about the litigations, there are two of them. 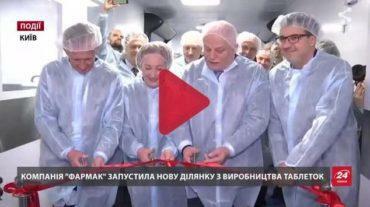 The first was initiated by Farmak in summer of 2017 and concerned the cancellation of the certificate for the mark for goods and services “Corvalol – Darnitsa”. That is Farmak’s properly lodged claim, which is being considered by commercial courts since that time. 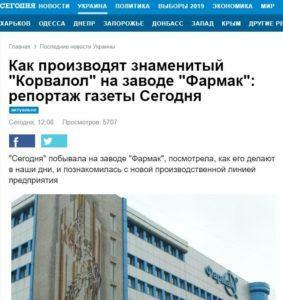 In response to this, Darnitsa filed a claim against the Ministry of Economic Development and Trade, involving Farmak as third party, for invalidation of the judgement of the Appeals Chamber recognizing the brand “Corvalol Corvalolum” as well-known. This brand and the judgement were among the grounds for our claim against Darnitsa. Therefore, by contesting it, Darnitsa intended and still intends to prevent us from pursuing the litigation to challenge the brand “Corvalol – Darnitsa”. 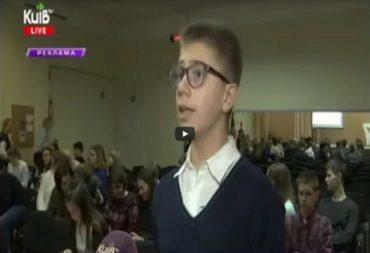 Darnitsa’s claim was dismissed in full by the court of the first instance: Kyiv City Commercial Court. Unfortunately, as we believe, the court of the second instance was absolutely prejudiced and biased, as it adjudged to the contrary. The judgment of the first instance was cancelled, Darnitsa’s claim was satisfied and the judgement of the Appeals Chamber in respect of the brand “Corvalol Corvalolum” was invalidated. Currently, this judgement is being appealed by both the Ministry of Economic Development and Trade, and Farmak; and the case is under consideration in the Supreme Court. When could the Supreme Court judgment be expected? It is difficult to say now, because at its first session concerning our cassation appeal, held in early October, the Supreme Court decided to suspend the consideration of this case, as the Grand Chamber was to pass a judgment on another case. In that case, the decision was made without any changes regarding the jurisdiction of such categories of cases as ours, so to date the Supreme Court Collegium reinitiated the proceedings concerning “Corvalol Corvalolum”. The hearing was scheduled on 20 November. Speaking about the legal aspect of the matter, what are the consequences of recognizing “Corvalol Corvalolum” as a well-known brand in favour of Farmak JSC? This means protection of rights to the designation, the trademark. It consists of several parts: there is a notion of trademark right, which is directly registered by the patent agencies of certain countries; therefore, in our country, the “Corvalol Corvalolum” brand has been protected since 1993. Thus, we are expanding our geographical presence, with registering this brand in other countries. However, there is also a procedure, according to which each state implements the recognition of a well-known mark as the highest degree of brand recognition for a particular owner, manufacturer of a particular product. This is envisaged by both the Ukrainian and international law and is protected by the Madrid Agreement on the Protection of Trademark Rights. There are many brands recognized as well-known in other areas, such as “Coca-Cola”, “Nike”, “Adidas”, “Lexus”. That is, in each area there are some marks that have deserved the right to such recognition. Therefore, this is not the first well-known brand for Farmak. We already have “Corvalol” recognized in 2004, but in Cyrillic. Currently, we use both Cyrillic and Latin script on packaging, which is included in all international pharmacopoeias. In 2017, Farmak JSC already obtained the recognition of the “Corvalol Corvalolum” brand as well-known, so the judgement of Kyiv Commercial Court of Appeal is for us absolutely absurd, as this mark complies 100% of high popularity criteria. There was one manufacturer of this drug product in 1960-s, the Lomonosov Plant; since 1993, Farmak JSC as its successor continues its manufacturing at the same facilities, under the same brand, and using the same technology. Farmak invests money in maintaining the quality and efficacy of the drug product. There was no other manufacturer and thus no grounds for doubts and claims that it is not Farmak’s brand. In legal terms, does the recognition of the drug product as well-known enable brand protection? It rather enables enhancement of such protection. There is a trademark, which usually has limited classes it applies to. For medicinal products, this is Class 5 of Nice qualification by types of activity or areas where this trademark is used. A well-known mark covers all classes and should not be registered separately in each of them, because this is an important trademark. There are two polarities, “well-known” and “commonly used”. A “commonly used” is a mark that does not have any differential ability at all, it is used in in everyday language by everyone, for example, thermos, laminate, parquet… Once, these were brands produced by only one company. But now, we cannot say that linoleum is a specific trademark; everyone understands that linoleum is linoleum, because there were hundreds of manufacturers of this coating, so everyone started to call it ‘linoleum’. Instead, “Corvalol” is manufactured by Farmak. This is a brand that distinguishes us from any other similar brands. What is also important from legal point of view is that the dispute concerns the brand, not the monopoly for the drug product itself. The drug product with all its components is not protected, not secured. Anyone who is able to arrange its production, prove efficacy and undergo all required procedures under its own brand can manufacture this drug product. Instead, this is about the use of “Corvalol” brand, which gives huge benefits to other manufacturers reluctant to invest for decades in its quality and efficacy, but wishing to obtain and use the same brand straight away. It is now at the stage of appellate proceedings. The court of the first instance has passed the long-expected judgement: since the well-known brand “Corvalol Corvalolum” was cancelled, our claim was dismissed. We understand that once the Supreme Court establishes some objective truth in this respect and the recognition of the brand as well-known is resumed, the court will further continue considering on the merits. The opinion of intellectual property experts, which have concluded on the similarity and misleading nature, will be taken into account. We do not understand these arguments of our opponents at all, because Farmak has been manufacturing the drug product under this brand for 58 years. When did Darnitsa start manufacturing “Corvalol”? In 2016. Since then, we have been in litigation. What will be if the Supreme Court adjudicates not in your favour? In any case, Farmak will not cease protecting this brand. Anyway, we can’t predict the outcome, but still we hope that the reformed Supreme Court will pass non-biased judgement. Otherwise, we will seek the other remedies for protection, up to the European Court, etc. Ukraine that became a party to all conventions on protection of intellectual property rights has signed the European Union Association Agreement. There are many international mechanisms. For now, however, we think that we will be able to secure justice in our Ukrainian courts. Is Darnitsa the only company that started manufacturing “Corvalol”? Are there any infringements regarding this drug product from the other companies? Yet, there is protection and defense of intellectual property rights around the world. For instance, “Coca-Cola” is an exclusive, world-famous brand. “Coca-Cola”, “Lexus”, “Aspirin”, “No-Spa” and all other world-famous brands also defend their rights and interests. Can you imagine someone calling a mobile phone “iPhone – Meizu”? No, Huawei, Samsung, Meizu make good phones, but they have their own name, their brand, and they develop it. So, they work as responsible competitors. Did you assess your losses? For now, we see that Darnitsa’s drug being marketed and taking our share of the market. We certainly have losses, but they cannot be precisely estimated yet. We want to complete all litigations, obtain the final judgment, whether we have protected our brand or continue to protect it. Then we will assess the scale of damages. To date, our competitor, without our consent, has registered and uses the brand “Corvalol – Darnitsa”, obtaining a competitive advantage in the market, because it is hard and expensive to enter this market quickly with a non-promoted name. Therefore, we understand that it basically obtains competitive advantages. Perhaps, the Antimonopoly Committee of Ukraine will take interest in this. Do you have similar litigations in Ukraine? Similar is an example with Zdorovye company. Zdorovye does not and did not have a trademark, yet they applied for and registered a drug product called “Corvalol – Zdorovye”. This is the same approach as with “Corvalol-Darnitsa”. They have registered their product in exactly the same way. Here, we also have proceedings for cancellation of state registration. However, they are not and were not on the market. So here, we deal only with the fact of registration. No. There is no such drug product and, we hope that there will not be any. In turn, we will cancel its registration in court. Yet, the approach is identical, when a word, allegedly identifying a trademark, is added to a well-known brand. Did you have such situation only with “Corvalol” or are there examples in respect of other drug products? If you achieve the cancellation of the trademark registration, what will be your next steps? The drug is being marketed. Will it be recalled? We will prohibit the use of this brand, demand to change its name. We have no claims to the drug product as such. It is great and highly required. Will you request its recall and marketing under another name in court? “Corvalol”, “Diazolin”, “Naftizin” are old Soviet brands. What is their share in the company’s economy; is there a reason to fight for them very actively? We do not classify our drugs as old and new. We classify them in certain therapeutic groups, etc. Indeed, we have manufactured some brands back in the Soviet Union, continued their manufacture after Ukraine’s independence and will continue it for a very, very long time. This is why, they are all protected. We have all trademarks, for “Naftizin” and “Diazolin”, for “Validol” and “Corvalol”. All our brands have been protected since early 1990s, when the patent office was established in Ukraine and the Law of Ukraine “On the Protection of Rights to Trademarks for Goods and Services” was adopted. We are a generic company that manufactures and markets the generics which are not under patent protection, but we have proved the equivalence, therapeutic efficacy, safety, chosen our brand we are already investing in, prove the quality and efficacy of our brand. We are only responsible for our brand. It is the brand that distinguishes our generic from the other one. So this is why it is so important to us. Could you tell us about the dispute with Bayer in Ukraine? At what stage is it now? The subject of the dispute is as follows. Bayer Intellectual Property GmbH filed a claim against Farmak to terminate violation of rights to one of Bayer’s patents in Ukraine, as Farmak had imported 9 kg of samples of a substance (API) for scientific purposes, to analyze the prospects for development of a generic product. Farmak’s position is that import of substance samples for scientific purposes, to analyze the prospects for development, is not violation of the patent holder’s rights. After long-duration proceedings, the court adjudicated in favor of Farmak and dismissed Bayer’s claim. I have a question about Russian sanctions. On 1 November, the Russian government issued a resolution imposing sanctions on Ukrainian individuals and entities. Farmak is also in this list. Sanctions virtually freeze the company’s property and prevent its withdrawal. Will Farmak be able to work with Russia further? As far as I recall your owner’s interview, you are no longer launching new drug products on the Russian market, but are not ready to instantly wind up your operations there, as this is the company’s economy. Absolutely. We have always said that we have a European vector of export development. Our company is export-oriented, we expand the geography of our products, explore new markets, contribute to the increase of Ukrainian exports in general, which is important for the country’s foreign trade balance. For us, the European vector is of primary importance. We focus on the Eastern and Western Europe, concentrating our main efforts and markets there, along with those in the former CIS countries. Therefore, the vector of our development is different; it is not focused on Russia. To date, these sanctions will not affect us too much, because our strategy is to explore new markets. In addition to Europe, there is Brazil, Argentina, and Vietnam. So far, it is difficult to assess the exact impact of these sanctions on our economic and financial performance. The company’s current position is that these sanctions will not materially affect us. Do these sanctions prevent you from working in Russia? In legal terms, I do not think so. We are analyzing the application practices; soon it will be clear how they will work. Anyhow, the impact will not be significant.